Subject: Plate : 'Abyssinier - Egyptenaars'. 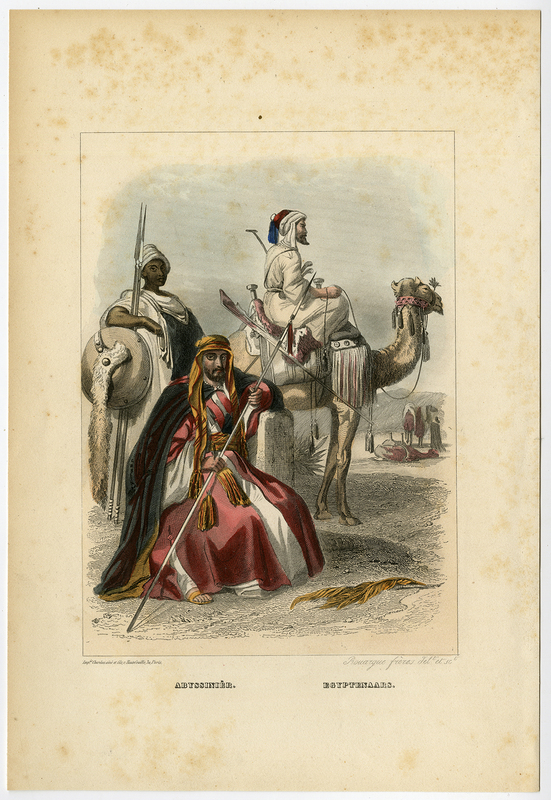 This plate shows 19th century costumes of Abyssinia and Egypt. Condition: Good, given age. Scattered foxing, mainly in the margins. General age-related toning and/or occasional minor defects from handling. Please study scan carefully. Medium: Steel engraving with original hand colouring on wove paper. Size (in cm): The overall size is ca. 17 x 25 cm. The image size is ca. 12 x 17.5 cm. Size (in inch): The overall size is ca. 6.7 x 9.8 inch. The image size is ca. 4.7 x 6.9 inch. Description: This original antique print originates from 'Reis om de wereld. Beschrijving van de verschillende landen en volken, zeden en gewoonten, godsdiensten en regeringsvormen en van de belangrijkste natuur- en kunstvoortbrengselen der aarde' by J. Bakker Korff (Dutch edition, original French edition by Champagne et Olivier). Published in Leiden, 1866. Artists and Engravers: This plate engraved by Rouargue Freres.